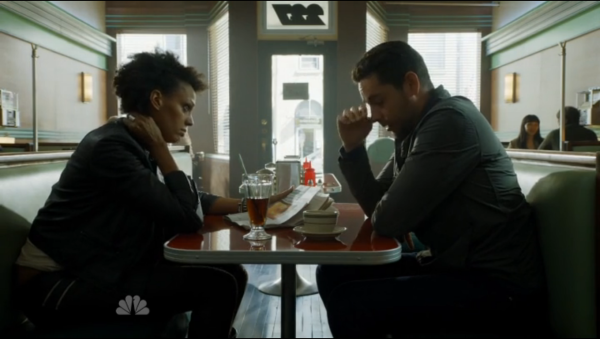 The Heroes have been reborn, both as a new generation of Heroes but also as a new series on NBC. I think it’s interesting that in several places this is considered a “mini-series” at 13 episodes, which is the same as a full season for cable shows and for any show that starts out in the mid-season without the added nomenclature. For my own part, I watched the first two seasons of Heroes when they aired, or at least the first season and a half, and came back to watch the final half of the fourth season which I did enjoy. And I have gone back to re-watch the first season again, and while I didn’t actually make it very far into the season, what I did manage to watch helped refresh some of the early moments of the show and revealed a similar structure to the great first season. This new season introduced a lot of new heroes and saved many of the returning faces for later in the series. The opening narration of Mohinder Suresh has been replaced with Jack Coleman’s Noah Bennett, who is obviously meant to be the recognizable face of the original show to help draw older viewers back in as a focal point. There is a fairly quick set up that explains some of the important events leading up to this show’s timeline that span the course of a year. There was initially the hope for peace between regular humans and those with powers, referred to here as EVOs. But there was a massive terrorist attack during a worldwide peace event between the two races where many people died and created this rift where EVOs have become the modern era witches that even gets specifically called out at one point. There’s also a strong connection with the racial tensions during the Civil War era via the underground railroad that one of the characters here participates in. Like with any of these world building series with a large number of characters, it’s often difficult to keep track of who’s who and what exactly is going on. It did take me until nearly the end of this two-hour premier to start to get a handle on many of the characters, but it did start to happen even though there are a large number of characters spread across the world once again. I do want to mention something that I loved about the first season and is carried on here is that this really is a worldwide show that brings together a very diverse cast. It does mainly focus on the US, but when you look at the lead characters there is a Black woman, one of the locations is in East LA with a mostly Hispanic cast, there’s also a section once again in Japan, and there are a few other people of color within the secondary characters. There’s also a nice mix of ages, from a younger kid around 9, up through the high school kid, and some of the middle aged cast returning from the first series. One issue I did have with this show were the special effects. It’s been nearly 10 years since the first season of the original Heroes, and while some of the effects do look much better, like Tommy’s teleportation effects, others don’t fare nearly as well. The biggest examples are the brief moment with the young Hispanic kid who shows that he is an EVO by putting his hand inside a guardrail or part of a roof or whatever it was and it looked like a very quick and cheap effect that wouldn’t have looked out of place 15 years ago. There’s also a large sub plot in Japan with Miko who is apparently this series’ analogue for Hiro. She has this sword that allows her to physically enter this video game world called Evermore which initially seems like a World of Warcraft style game only with a Samurai motif and graphics that don’t look that far removed from World of Warcraft. While it’s not blocky, the textures are very smooth and the motion capture is very rough. She even has her own Ando in the form of this gamer nerd who found her through the game. The main difference is that he has more of Hiro’s personality while she has his ability. What the show does do quite well, and was also noticeable in the original series is the color palatte and the frequent framing of characters inside artificial panels, whether it’s a window or a hallway, or something else the look of the show is its greatest advantage much like the look of Gotham. I really liked the use of color, and not only that it uses color, but the colors match up quite well to the first season with their reds, blues, and yellows. If you look at the screenshot right below I have a scene taken from this episode on the left next to a scene taken from the first season on the right. 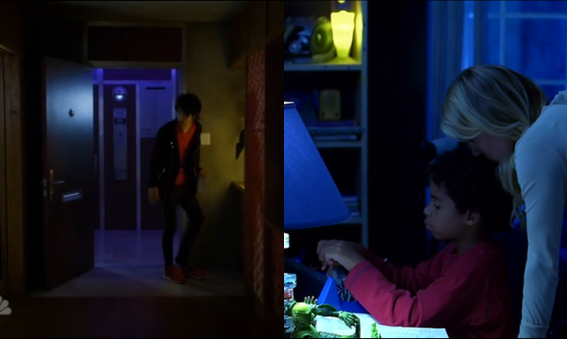 While they are in different proportions, you can see how the blue in the doorway closely matches the blue of Micah’s room, they are both wearing the bright red shirt, and there is a yellow light for accent though it is just offscreen and slightly muted in the new scene. As far as the characters go, it’s difficult to get a read on everyone just yet. I’m not entirely sure about the EVO exterminating couple led by Zachary Levi, though it does seem like there’s some connection between him and Tommy. I’m just not exactly sure what that connection will be. I predict that Levi will have some type of redemptive arc where he will become sympathetic to the EVOs and will have to turn on his partner at some point in order to help save the world. I did also like the concept behind the Luchador vigilante, especially since it combines the fact that the mask is more of a symbol than a person as more than one person has worn the mask, and the impression is also given that most if not all of those who wore the mask weren’t actually EVOs themselves. I also do really like Noah Bennett as he appears in this show, I don’t exactly remember much of what he eventually became in the original series, but it’s almost like he’s a different person. He’s had a portion of his own memory wiped as part of his own plan, and now he’s essentially trying to uncover his own past, in a way he has to try and outwit himself. I also liked Quentin who essentially becomes his sidekick here, and if you’re curious about him and his sister, that is the entire focus of the webseries Dark Matters which I wrote about just a few days ago and can still be watched online. At this point, it’s too early to tell how this series will come together, but I do think that it shares much more with the promising first season than it does with the later seasons. There is a great sense of mystery and impending doom while we slowly get to know each of the new characters and how they will fit together. The sense of discovery is gone with the exception of Miko who is the only character that is new to her power, and to a lesser extent Tommy who is only just now coming to understand his power which he had been running away from before. That sense of discovery is replaced with the sense of repression and fear, instead of coming into their powers, they are only using them in extreme circumstances. And at least for now, I’m in and ready to see where this season takes me.